It seems like there are new products coming out left and right to make our job as being a parent a bit more easier. I love that Playtex is one of those companies. They just keep coming out with products that help make a different for both baby and mommy. That's why I was super excited to receive their Diaper Genie Activated Carbon Filter. This filter is designed to lock in odors instead of covering them up with a pretty fragrance. They come in a package that contains one carbon filter case and includes four carbon filters. This sounds pretty great for me. The last time I used a diaper genie was when my now almost seven year old was a baby and since we have a little one on the way, this filter seems like it's going to make a world of difference when using the diaper genie. 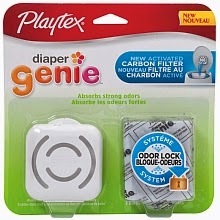 I can remember using my diaper genie before in the past and although while closed the smell didn't leak out, but once you opened it to put another diaper in it, the odor was just overwhelming. So I am definitely looking forward to trying this filter out with the new baby once she's here and the dirty diapers start piling up. One thing I do love about these filters is that they aren't just for your diaper genie. You can use them for just about anywhere. It's great when potty training and I've been using one in the back of my minivan which contains all of my kids soccer and dance attire. Let me tell you, just one of the filters have been a huge relief to have in the van when traveling back and forth from one practice to another. Not to mention when I carpool and have a few soccer friends and their equipment in the van as well. You simply don't smell anything at all. This has definitely been making our trips a lot more easier. If they can cover up the mask smell of soccer and dance, I'm sure these filters will make a huge difference when using your Diaper Genie. To find out more about the DG Activated Carbon Filter and other Playtex products be sure to head on over to www.mommyville.ca for more info!